On May 9th the Canadian Government has issued 3,500 new Invitations to candidates in the Express Entry pool for seeking PR Status in the country. The Comprehensive Ranking System norm here was 441. Immigration, Refugees and Citizenship Canada has made use of the tie-break process for this draw to select the candidates. The cut off date and time for the candidates of the pool who submitted their profile was December 12, 2017 at 01:51:38 UTC. The rule offers priority to candidates who stay in the pool for a longer period. Thus all candidates having a CRS of or above 441, and also those candidates who submitted their profile before the deadline can receive an Invitation to apply in this draw. Furthermore, this draw was not limited to a specific program of the Express Entry system. The entry norm in the federal Express Entry pool, is that the candidates had to meet the eligibility regulations for an immigration program under the management of the Express Entry system.These are the Federal Skilled Trades Class, Federal Skilled Worker, or Canadian Experience Class. 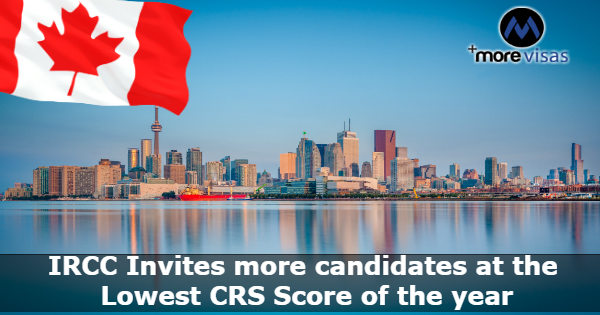 The CRS score of the candidates in the pool depends on work experience, education, ability in language, and other criteria. The CRS score effectively determines the ranking of an aspirant in the pool. All Candidates who get the ITA must submit an application seeking Canadian PR to Immigration, Refugees and Citizenship Canada in a period of 90 days only after they receive the ITA. This was launched on January 1, 2015 and its initial draw was held on March 14, 2015. The date of the recent draw is May 9, 2018. The record for lowest CRS points for selection in the Federal Skilled Trades Class was 199 on May 26, 2017. For the Federal Skilled Worker Class it was 413 on May 31, 2017 and finally for the Canadian Experience Class it was 413 on May 31, 2017. On April 12, 2017 the authorities issued largest numbers of invitations to apply- 3,923. The smallest number was 143 on May 26, 2017. Moreover, the largest decrease in CRS points between two consecutive draws was 273 on May 22, 2015 and June 12, 2015. Moreover, the least decrease in CRS points between two consecutive draws was nil thrice. Additionally, the Longest gap, between two consecutive draws, was 35 days between April 17, 2015 and May 22, 2015 . Moreover, the shortest gap between dates of two consecutive draws was merely 5 days, between May 26 and May 31, 2017. Finally the figures for the Total number of ITAs issued in 2015 was 31,063, in 2016 it was 33,782. The figure for 2017 was 86,023. So far the Total number of ITAs issued in the present year is 28,800. So far totally 178, 868 candidates received the ITAs.